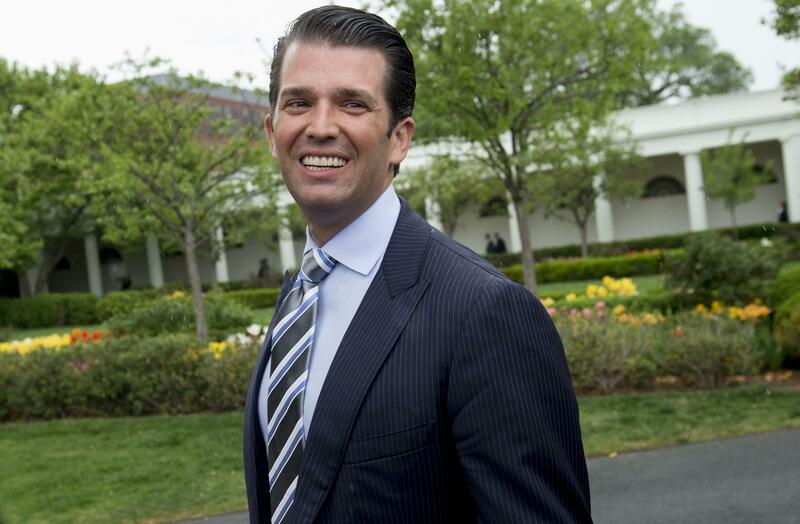 Donald Trump Jr. occasionally direct-messaged on Twitter with WikiLeaks, beginning in Sept. 2016 and continuing through the presidential election and beyond, CBS News has confirmed. The communications largely consisted of WikiLeaks offering information and advice to Trump Jr., and asking for things ranging from Donald Trump's tax returns to a recommendation for an ambassadorship for WikiLeaks founder Julian Assange. The messages, which were first reported by The Atlantic, began in Sept. 2016 with WikiLeaks messaging Trump Jr. on Twitter to apprise him of an anti-Trump site called putintrump.org that was about to launch. According to The Atlantic, Trump Jr. thanked WikiLeaks and said he would ask around about it. CBS News has also confirmed that the messages have been turned over to congressional investigators as part of their investigation into Russian meddling in the 2016 presidential election. Most of the messages, The Atlantic reported, were initiated by WikiLeaks, and were mostly, but not always, ignored by Trump Jr.
Monday evening Trump Jr.'s lawyer, Alan S. Futerfas, issued a statement in light of the report. WikiLeaks at one point asked for Donald Trump's tax returns prior to the election, one message obtained by The Atlantic shows. "Hey Don. We have an unusual idea," WikiLeaks wrote on Oct. 21, 2016. "Leak us one or more of your father's tax returns." The organization argued that The New York Times had already published "a fragment" of Mr. Trump's returns, and "the rest could come out any time" through an equally "biased" source. WikiLeaks was also pressing for the returns because "if we publish them it will dramatically improve the perception of our impartiality." And if the group could be seen as impartial, it reasoned, "the vast amount of stuff that we are publishing on Clinton will have much higher impact, because it won't be perceived as coming from a 'pro-Trump' 'pro-Russia' source," the message said, according to The Atlantic. The Atlantic also reported that WikiLeaks also -- through its messaging with Trump Jr. -- advised the campaign to protest the outcome of the election as rigged. After the election, WikiLeaks tried messaging Trump Jr. directly again. "Hi Don. Hope you're doing well!" WikiLeaks wrote on December 16 to Trump Jr., according to The Atlantic. "In relation to Mr. Assange: Obama/Clinton placed pressure on Sweden, UK and Australia (his home country) to illicitly go after Mr. Assange. It would be real easy and helpful for your dad to suggest that Australia appoint Assange ambassador to [Washington,] DC." On occasion, Trump Jr. responded. In Oct. 2016, WikiLeaks wrote to Trump Jr. to ask "if you guys could comment on/push this story," and attached a remark from Hillary Clinton saying she wanted to "just drone" Assange. "Already did that earlier today," Trump Jr. responded later that day. "It's amazing what she can get away with." WikiLeaks also offered advice to Mr. Trump through his son. "Strongly suggest your dad tweets this link if he mentions us," WikiLeaks wrote, directing Trump Jr. to a link what would point Trump supporters toward stolen documents. "There's many great stories the press are missing and we're sure some of your follows [sic] will find it," WikiLeaks continued, according to The Atlantic. "Btw we just released Podesta Emails Part 4." Trump Jr. may not have responded to that message. But just 15 minutes after it was sent, as The Wall Street Journal's Byron Tau pointed out, Mr. Trump himself tweeted, "Very little pick-up by the dishonest media of incredible information provided by WikiLeaks. So dishonest! Rigged system!" The Atlantic says Trump Jr. stopped responding to WikiLeaks' direct messages in mid-October, and WikiLeaks afterward began to make more dramatic requests, in addition to the one for the tax returns, including the following. Trump Jr. responded to the reports on Twitter, and posted 10 images of what he says are the entire conversation with the WikiLeaks account. "Here is the entire chain of messages with @wikileaks (with my whopping 3 responses) which one of the congressional committees has chosen to selectively leak," he posted in one tweet. In the screenshots, Trump Jr. only responds to messages about an anti-Trump PAC, "Off the record but I don't know who that is. Thanks." In another message, he asks what the day's leaks were about. "What's behind this Wednesday leak I keep hearing about." If Mr. Trump were to lose, WikiLeads said on Nov. 9, 2016, "we think it is much more interesting if he DOES NOT conceed [sic] and spends time CHALLENGING the media and other types of rigging that occurred—as he has implied that he might do." Another suggestion was to ask Mr. Trump to suggest Assange should be made Australian ambassador to the U.S. As WikiLeaks put it, according to The Atlantic, the president-elect might say, "'That's a real smart tough guy and the most famous australian [sic] you have!' or something similar," WikiLeaks wrote. "They won't do it but it will send the right signals to Australia, UK + Sweden to start following the law and stop bending it to ingratiate themselves with the Clintons." And then in July, according to The Atlantic, there was another mail -- just after The New York Times reported on Trump Jr.'s meeting with Russian lawyer Natalia Veselnitskaya. WikiLeaks attempted to convince Trump Jr. to turn his emails with publicist Rob Goldstone about the meeting over to WikiLeaks. Instead, Trump Jr. tweeted them himself.